This map shows the route driven by NASA's Mars Exploration Rover Opportunity during a reconnaissance circuit around an area of interest called "Matijevic Hill" on the rim of a large crater. SAN FRANCISCO — NASA's Mars rover Curiosity may be dominating the headlines, but its older, smaller cousin has made its way to a spot on the Red Planet that may have been capable of supporting life long ago. The Opportunity rover, which landed on Mars in January 2004 along with its twin, Spirit, is currenlty studying clay deposits on the rim of the Red Planet's Endeavour Crater. The clays imply that the area was exposed to relatively neutral — as opposed to harshly acidic or basic — water long ago, researchers said. "This is our first glimpse ever at conditions on ancient Mars that clearly show us a chemistry that would've been suitable for life at the Opportunity site," Opportunity principal investigator Steve Squyres, of Cornell University, told reporters here today (Dec. 4) at the annual fall meeting of the American Geophysical Union. Opportunity didn't just stumble blindly onto the clays. 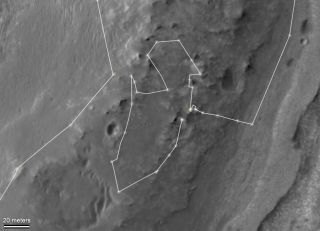 NASA's Mars Reconnaissance Orbiter spacecraft spotted them from orbit, leading the rover team to point the golf-cart-size robot toward its current location, which is known as Matijevic Hill. Opportunity has already circumnavigated Matijevic Hill, which was named after the late Jake Matijevic, who led the Spirit and Opportunity engineering teams for several years. Such a "walkaround" is exactly what a human field geologist would do to get the lay of the land, Squyres said. The rover will likely stay at Matijevic Hill for a while, trying to understand how the clays were laid down billions of years ago, Squyres said. Part of the work will involve investigating mysterious tiny spherules Opportunity has discovered embedded in the clay matrix. The Opportunity team initially thought the BB-size gray spheres were similar to the iron-rich "blueberries" that the rover has found elsewhere on the Red Planet. But initial analyses have shown that's not the case, leading Squyres to dub them "newberries." The team isn't sure exactly what the newberries are, or how they formed. "I think a big part of the story is going to be understanding the newberries," Squyres said. "I think figuring out the newberries is going to be fundamental to understanding how this clay-bearing unit was emplaced." Opportunity and Spirit were tasked with three-month prime missions to search for signs of past water activity on Mars. They found plenty of it, and then kept on going. Spirit stopped communicating with Earth in 2010, and NASA declared the rover dead last year. But Opportunity is still going strong. It has some age-related issues, such as an arthritic arm, but the rover remains in good health, Squyres said. "Every day is a gift at this point," he said. "We're just going to push the rover, and push ourselves, as hard as we can."